It is snowball season. We had our second snowfall this past week - again people don't remember how to drive slowly with caution. These are happy snowballs - perfect for your Christmas cookie tray. Or any other time you want to zest a lemon. Someday, I will own a zester (hint: Santa), but until then my grater works just fine. Beat butter/margarine at medium speed until creamy; gradually add 1/2 cup powdered sugar and extracts. Add flour, lemon rind and salt, beating until combined. Stir in coconut. Cover and chill 30 minutes. Shape dough into generous 1 inch balls; place on parchment paper (or silicone mat) lined baking sheets. Bake at 350 for 15 to 20 minutes until golden on bottom but still pale on top. Cool for 5 minutes. 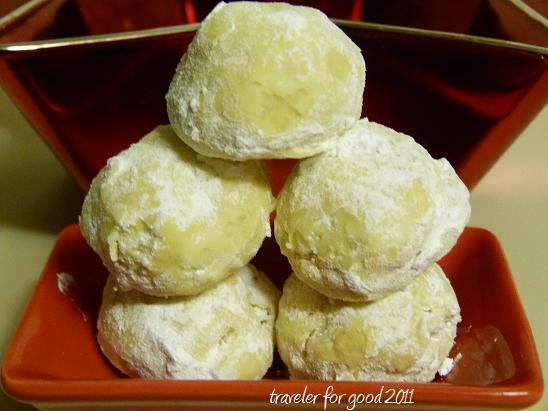 Place 1 1/2 cups powdered sugar in a bowl and roll warm cookies, coating well. You will have time to set the down and then roll them again (and again). The more powdered sugar, the more they look like snowballs. Depending on how big you roll your snowballs, the recipe will make 2-3 dozen.